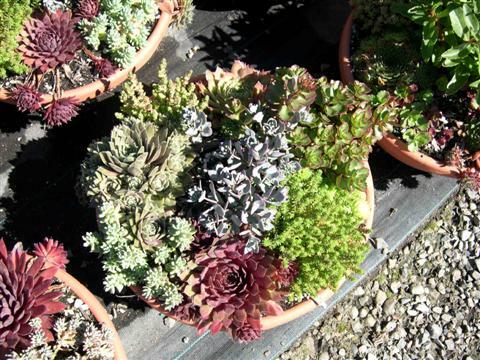 Last season, in order to augment our 4 inch and 6 inch container sales, we experimented with planting up mixed Sedum & Sempervivum containers in various sizes and types. 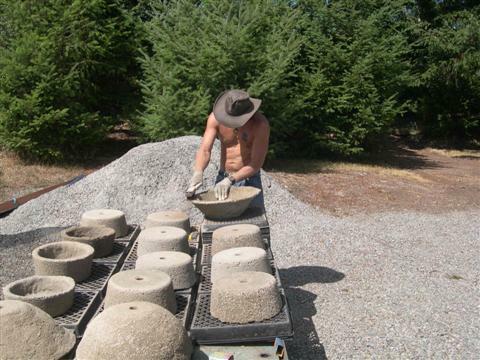 We planted up shallow hypertufa containers in the spring and plastic bowl shaped containers in early summer. The plastic containers were a big hit for early summer sales. We sold around 700 of them to retail nurseries. The bowls used were 12", 14" & 16" (30 cm, 36 cm, 41 cm) in the colors 'terra cotta' and 'stone white'. 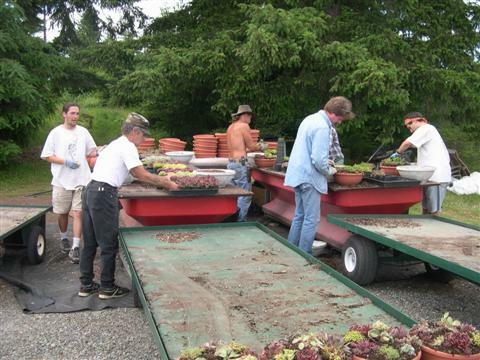 The 'stone white' containers were very difficult to sell, so we eventually ended up transplanting all of them back into 'terra cotta' colored containers. All sizes sold, but the 12" (30 cm) size sold 4 to 1 over the other two sizes. The wholesale price on the 12" (30 cm) size was $14.00 USA. Price point seemed to be an important issue in the summer months. Larger sizes had too high of a price tag for most stores at $19.00 & $22.00 wholesale. 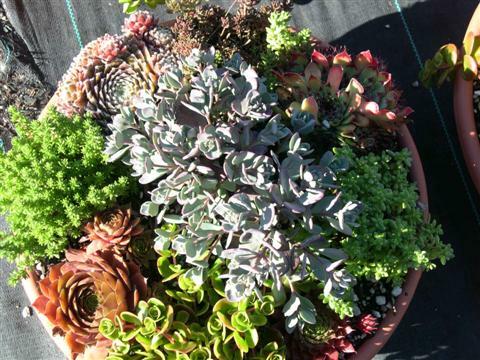 This year we will plant 1,200 of the 12" plastic, bowl-shaped planters in terra cotta. 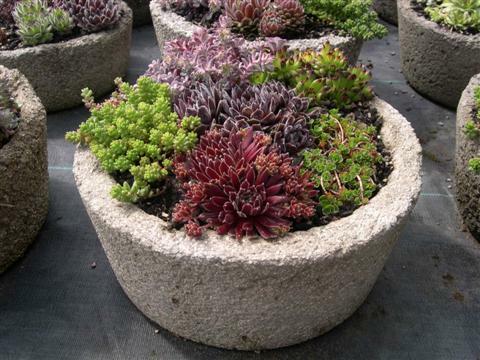 Hypertufa is another type of planter that sells very well for us when planted with Sedums and Sempervivums. 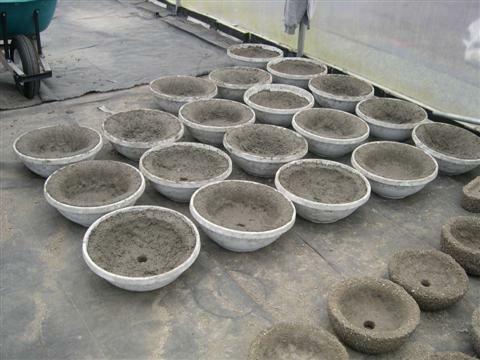 Hypertufa is a material that was formulated to emulate tufa rock that was hollowed out and used in years past for watering troughs and planters in England and other parts of Europe. 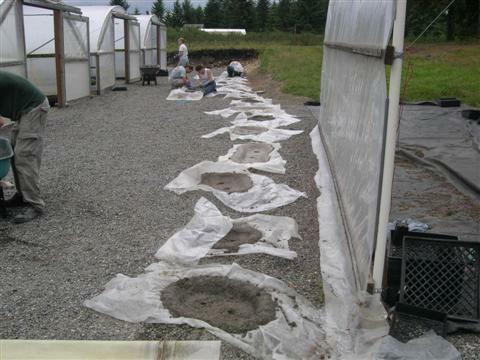 There are different recipes that can be used but we use 1 part Portland cement, 1½ parts sifted peat moss, 1½ parts (the last ingredient can vary) vermiculite, perlite, pumice or sand. We prefer vermiculite as the third ingredient because of its light weight, the ease of wire brushing and the look of the finished product. and enough water is added to make a thick, not runny, mixture. This mixture is pressed by hand, wearing rubber gloves, into molds. For strength we make the material 1½ to 2" thick. A piece of PVC pipe is used like a cookie cutter to make drainage holes in the bottom of the containers while the material is still slightly moist. We use plastic bowls from the dollar store and the recycled 'stone white' plastic bowls mentioned earlier, as molds for the smaller planters. The plastic containers are sprayed with Pam or any other non stick cooking spray to aid in removal after 2 days. After setting for 2 days, the material is dry enough to handle without falling apart. At this point we use wire brushes with a circular motion to rough up any surface that will show. 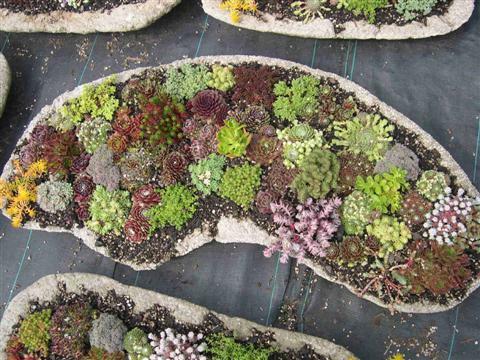 This is one of the most important steps because it gives the planter the natural stone texture that makes it perfect as a sedum planter. We make our planters in the summer and don't plant them up until the following spring. Usually 1-2 months of curing is a good enough though. 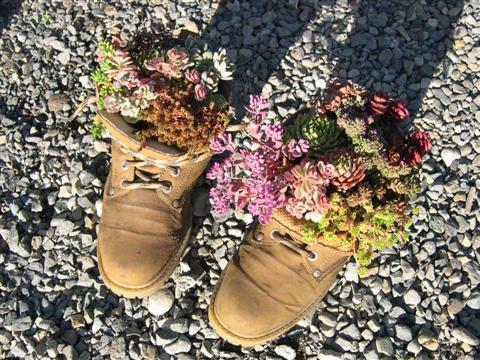 To make free-form planters we use an unconventional technique. On flat ground, a thick bead of gravel is put down in any continuous shape desired. A sheet of plastic is placed over the top of this gravel mold. 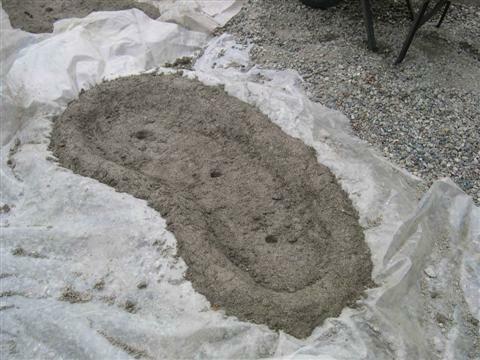 Then the cement mixture is pressed thickly onto the plastic sheet and up the wall of gravel. 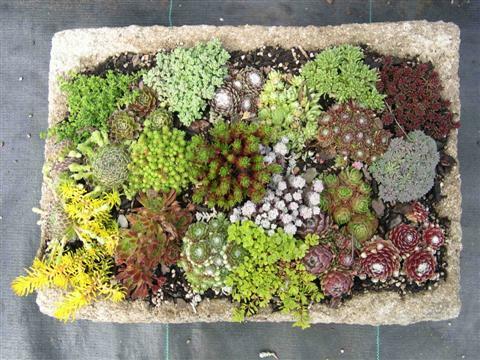 These planters are quite shallow and actually work quite well for Sedums and Sempervivums. When we plant this shallow type of container, the soil in the finished planter is mounded to help aid water runoff in the winter months and to add more root room. Last year 4 nurseries bought all of the hypertuffas that we had planted up. Money didn't seem to be a big issue with retailers and wholesale prices varied from $20.00 to $120.00 USA (They retailed for $40.00 to $250.00). This year we made 200 planters, which should give all of our customers a chance to buy. 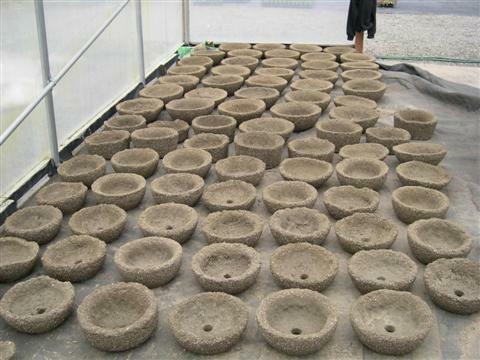 We will sell all of our hypertufa planters in the spring before the plastic planters become available. 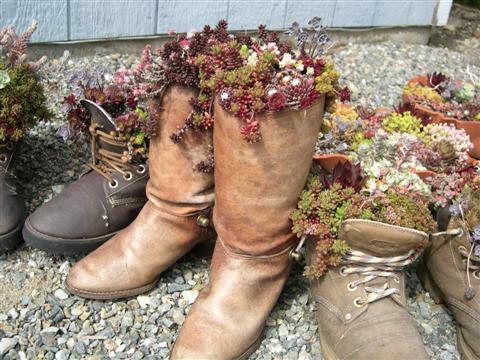 We've used shoes and boots as planters for succulents also. 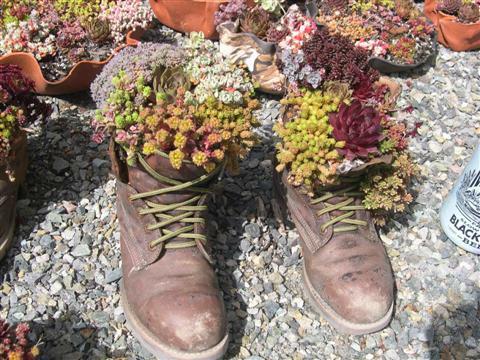 We pick them up used from local thrift shops, fill them with soil and plant Sedums and Sempervivums in them. 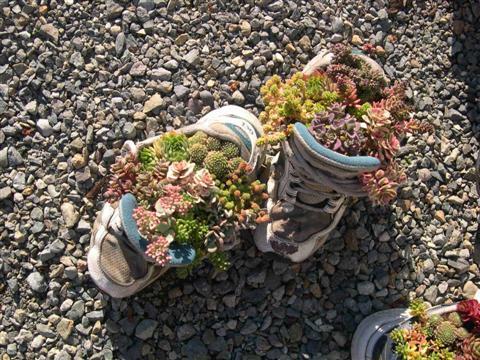 We drilled holes in the bottoms of the shoes before planting them for fear that some leather boots and shoes might fill up with water with the winter rains. I think these would sell quite well if we could keep friends and family from getting to them first. My sister ended up with 3 pairs in her front yard. I only managed to get one pair for myself. Since I'm not willing to go around bare footed, I'll have to make another trip to the thrift shop for shoes before we can make more. 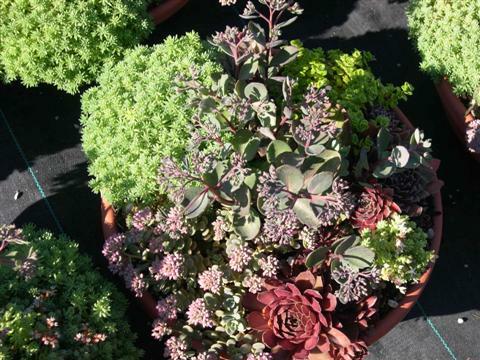 We have plans to make up succulent dish gardens this season using tender Mexican Sedums as well other tender succulent plants. Since people are willing to spend lots of money on annuals for their yards, they should also be willing to spring for mixed variety tender dish gardens for their deck or porch. I think that these will be quite popular in both plastic and hypertufa. S. acre 'Elegans', S. acre majus, S. album varieties, S. anacampseros, S. anglicum varieties, S. apoleipon, S. brevifolium, S. borschii 'Anna Schallock', S. cauticola varieties, S.dasyphyllum varieties, S. divergens, S. ewersii varieties, S. gracile, S. grisbachii, S. hirsutum, S. hispanicum varieties, S. pluricaule ezawe, S. kimnachii, S. maknoi varieties, S. monregalense, S. oreganum, S. orizifolium 'Tiny Form', S. pachyclados, S. pallidum, S. rubrotinctum, S. rupestre 'Cristatum', S. rupestre 'Angelina', S. sexangulare 'Weisse Tatra', S. sieboldii, S. spathulifolium varieties, S. spurium varieties, S. stenopetalum, S. tetractinum and S. zentaro-tashiroi.